SEOUL, Aug. 3 (Yonhap) — “A Taxi Driver” on the 1980 pro-democracy uprising in Gwangju dethroned fellow Korean historical blockbuster “The Battleship Island” at the box office on its opening day, data showed Thursday. The period drama starring Song Kang-ho and German actor Thomas Kretschmann conquered the previous one-week leader, selling a total of 697,858 tickets on Wednesday, according to the computerized box office tally from the Korean Film Council. “A Taxi Driver” was screened 7,068 times on 1,446 screens across the country. 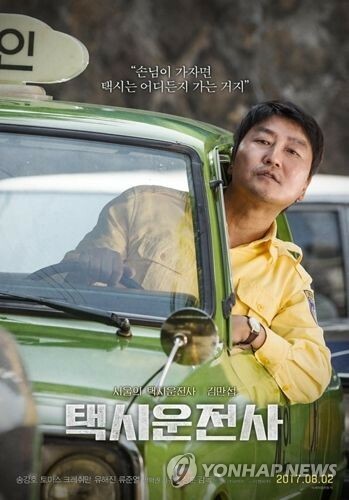 Directed by Jang Hoon, the movie tells the story of a Seoul taxi driver named Man-seop who happens to take German reporter Jurgen Hinzpeter to Gwangju, some 330 kilometers south of Seoul, for a big money offer and witnesses the horrors of the bloody military crackdown on the May 18 uprising. “The Battleship Island” attracted 248,021 moviegoers on its eight day of run, bringing the accumulated number of views to 5.18 million. It was available on 1,108 screens, down from 2,027 on its first day. Based on the history of Japan’s Hashima Island, better known as Battleship Island after its resemblance to a warship, during World War II, the film tells the story of hundreds of Korean forced laborers who risk their lives to escape. The animated Hollywood film “Despicable Me 3” took third place, adding 190,001 viewers to its domestic total of 1.92 million.